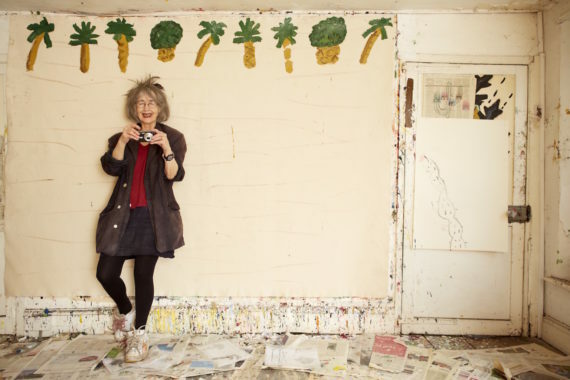 Critical and popular success have been achieved late in her life, but Rose Wylie’s recent rise has hardly been anything less than meteoric. 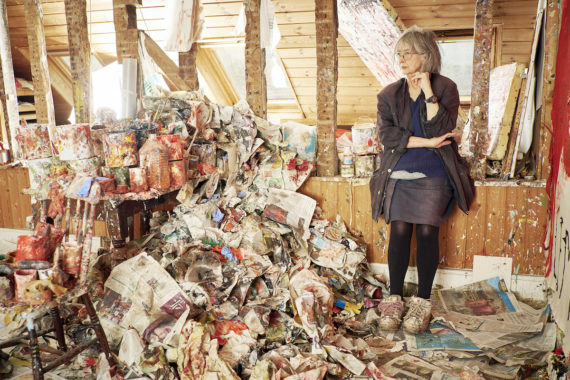 Her first major exhibition was held at Jerwood Gallery, Hastings in 2012, when she was 77. Since then she’s quickly established an international profile: her museum shows include surveys in America, Norway and Germany and, closer to home, Tate Britain. Wylie was given the Paul Hamlyn Award in 2011 and won the John Moores Painting Prize in 2014. 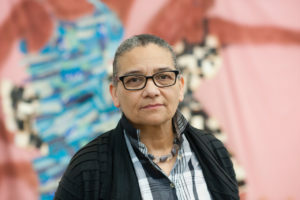 In 2015 she became a member of the Royal Academy of Art, and in the same year won the Charles Wollaston Award for most distinguished work in the RA’s Summer Exhibition. Having studied at Folkestone and Dover School of Art in the 1950s, Wylie then gave up painting for decades to raise a family (she was married to the painter Roy Oxlade, until his death in 2014). She returned to full-time painting when she attended the Royal College of Art in her mid-40s, where she graduated in 1981. 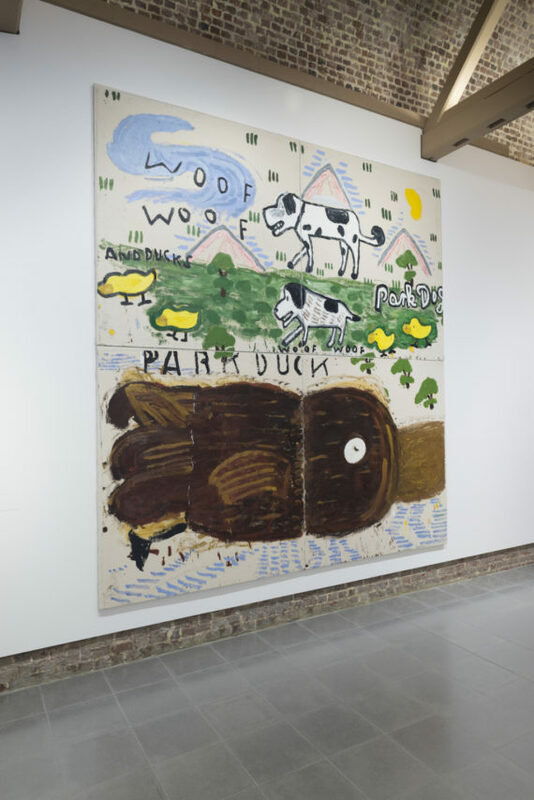 Wylie continues to work in an extremely cluttered studio in her 17th-century cottage in Kent, where she produces huge paintings on unstretched, unprimed canvas featuring imagery derived from incidental observations and pop culture. 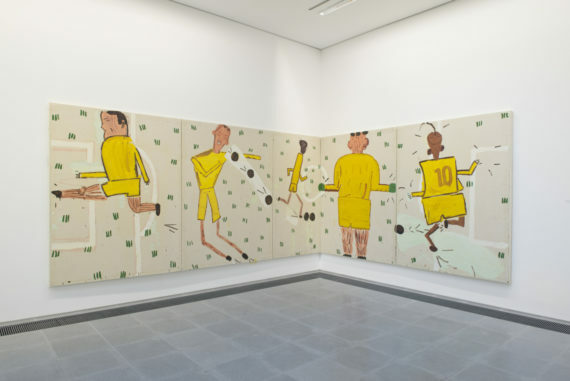 Her current exhibition of recent paintings is at the Serpentine Sackler Gallery, London. 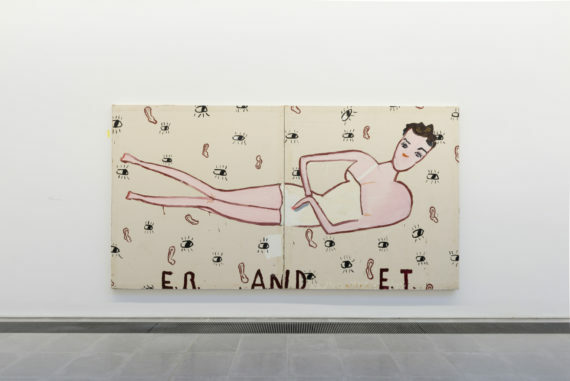 Let’s start with the title of your current exhibition at the Serpentine Sackler. Why ‘Quack Quack’? One, it seems ridiculous. That’s the first thing. But it isn’t. The noise animals make translates into any language, so there’s a wonderful parallel with painting, because painting doesn’t need to be translated, whereas literature and writing do. I had a museum show in Norway and I called it ‘Woof Woof’ because I thought it was subversive, funny, Dada-esque and non-pretentious. I like things being non-pretentious. But there were no dogs in that show and here there are ducks. The parks are being marginalised because of maintenance costs and they’re selling off London park space, so the ducks become a metaphor for luxury development. So the title is political and it’s translingual, and I love ducks. It couldn’t be more apt. I’m glad I asked you that question because it seems there’s a lot going on in that title. Yes, a lot hinges on it. I was also was thinking of these two words, ‘ack ack’ – you won’t know it, because you’re too young, but ack-ack is anti-aircraft fire, and we heard an awful lot of it when I was young. So I made the association between ‘ack-ack’ and ‘quack-quack’. I thought that it’s such a memorable title. I find taxi drivers love it. It’s not like a long quote from literature or anything. And it’s childish and I’m called childish, which irritates me no end, so the title is a kind of fling back in the face. Films and magazines are an important source for your paintings. Tell us what attracts you to particular images. It is. For instance, the first painting you see [as you enter the exhibition] is Pink Skater and I spotted her picture in the Observer magazine. She was swimming outdoors in December and she had a pink costume on and her arms and legs were flung out. She had a big physique and she was so happy and exultant. It was a wonderful photograph and I took it out of the paper and I thought, ‘I can use this’. She was so unaffected by public opinion that she was a big lady and was very attractive with it. Statuesque. Stunning. She would only be out of character in a society that likes very thin. And I also had a card from the Hayward Gallery for a private view and there was Paolozzi’s skater on it [7. Take Off, 1972, part of the artist’s ‘Bunk’ series of prints]. And I saw the pose was the same and they were both wearing pink. The first woman, the swimmer, was exultant. The second one was naff – you know how some people look like they’re laughable, but they don’t think they are. And so I fused the two. When you look at an image do you know immediately that you’re going to paint it? I often do. I think, ‘Well, that’s smashing, I’m going to do something with that.’ So I’ll make drawings, because I want to remember it. I make loads of drawings. They won’t be closely like it but they will have the same quality. The quality I liked in the first place goes into the work. When you first started out in the 1950s, were you inspired by what was going on in British art at that time? No. Stuff that we were offered at art school were people like Piper, Sutherland, Kenneth Armitage, but the big people were Matisse and Picasso. There images were all over the newspapers as still new and exciting, whereas the English ones were just… English. And pop art was just about to explode. Did that become a big influence for you at the time? It hadn’t started when I’d just got to art school. But I think it was an interesting open door, pop. It was something new and it did something different. And that was exciting, but it was more exciting later then it was then. Then you were a bit suspicious of it. I knew I was suspicious – you know, shiny toothpastes, and all the glamour of Hollywood. I thought it was slick, not ‘proper’ – not like Cézanne or El Greco. We were steeped in reverence for the masters of before. You only started to get exhibitions and press attention when you were in your late seventies. There was a lot of sexism and ageism accompanying that coverage, as if someone of your age might be expected to paint dainty flowers instead of massive pop canvases, even though you were exactly of that generation that might be drawn to massive canvases featuring pop culture references. How did that make you feel? It was silly, stupid. ‘You’re a woman, so why do you paint so big?’ ‘You’re old, you shouldn’t be painting like that.’ It was distinctly irritating. So yes, I certainly noticed it. How could you not? And I’ve painted dainty plastic ballerinas on cakes, because, why not? But the thing is I don’t think there’s any hierarchy in subject matter. I think you can paint anything and it’s the way to paint it, that’s the important thing, not your age, not your subject matter, not your nationality, and not your gender. You were married to the wonderful painter Roy Oxlade [until his death in 2014]. Would you say you influenced each other? We shared certain aesthetic points. But he was in a sense more 20th century than me. 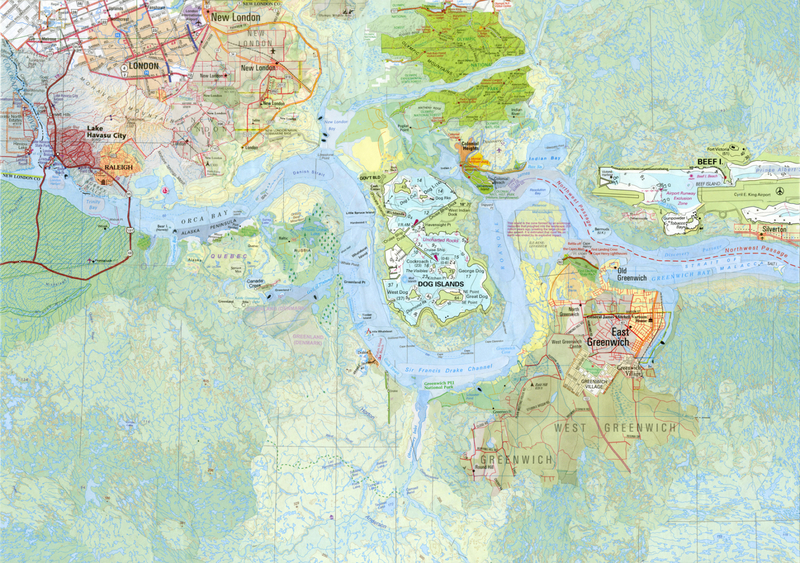 I like antiquity and the late Renaissance and I love emerging cultures. I’ve always liked Cuban and Mexican painting – anything that’s not quite the European stereotype of historical development. I think he was more impatient with the Renaissance than me. He thought painting should be fast and immediate. And I thought, ‘Why should painting be fast?’ I love frescoes and there’s nothing fast and immediate about a fresco; it’s all worked out beforehand. But also I think he had to search more for a subject, whereas I find my subjects everywhere and they can be anything. He was very supportive, and we were huge mates and we had a great deal of exchange, but we didn’t interfere in what the other was painting. And he wasn’t terribly keen on the state that my studio was in, so he wouldn’t visit. He didn’t think that a studio could quite be in that state of disruption. I like it because it’s not sterile – it’s not like a hospital and I have complete freedom in it.